Avoid late-night dietary disasters that can ruin your physique and even your sleep. Here are the 5 worst offenders, and 5 great alternatives for when you've got the munchies. While surfing through Colbert, Stewart, and Fallon, your stomach starts to rumble. There's no shame in giving in to a snack attack late at night; we all do it. But if you don't tread lightly, you could easily blow up your physique. That's because the wrong post-sunset snack choices can easily end up padding your midriff with flab and even jeopardize your night of restful sleep, which is essential for building muscle like a pro. To avoid this pitfall, here are five of the worst snacks you can reach for when the late-night hunger pangs strike, and their smart alternatives to avoid a next-day food hangover. Over the past several years, dark chocolate has become a snack hero of sorts. That's because this dark delight is laced with body-friendly antioxidants shown to help fend off a range of maladies. A word of caution, though: Luxuriating in a chunk of dark chocolate should be a daytime activity rather than one you do in the wee hours. Chocolate is a natural source of stimulants such as caffeine and theobromine that can keep you tossing and turning for hours by charging up your nervous system. A good night's rest is essential for building a glance-worthy physique. This is the time when a significant amount of muscle recovery occurs, and when the body releases anabolic hormones like testosterone and growth hormone. Snacking on foods that disrupt your shut-eye could very well sabotage your fitness gains. Similar to cocoa, carob comes from the pod of a tropical tree that contains an edible pulp. It possesses a sweet, chocolaty flavor similar to dark chocolate, but carob is caffeine-free, so it won't lead to a night of counting sheep. Like dark chocolate, carob harbors antioxidant firepower. Who hasn't dug into a bowl of comforting breakfast cereal when the late-night munchies strike? Make this a snack habit, though, and your midsection will definitely remain a few cans shy of a six-pack. The problem with most boxed cereals—and not just the ones adorned with cartoon characters—is that they're chock-full of sugar, which can spike your blood sugar. Late in the day, when your metabolism starts to become more sloth-like than Usain Bolt-like, this sudden rise in blood sugar can trigger fat storage and ruin your buff-to-blubber ratio. While the golden popcorn at the multiplex is a calorie-bomb, homemade popcorn is much less of a snacking disaster. The slow-digesting carbohydrates in popcorn work to transfer the amino acid tryptophan to your brain, where it's used to fire up the production of the sleep-inducing neurotransmitter serotonin. Many nutritionists agree that it's not wise to eat a calorie-rich snack shortly before hitting the hay, so the mere 93 calories in three cups of plain popcorn makes it a winner. Choose bags of loose kernels and pop them on the stovetop. Don't rely on bags of microwave popcorn, which are often doused in unhealthy fats and sketchy chemicals. You can also find bags of plain prepopped popcorn. For the most part, ice cream contains a snacking double-whammy. 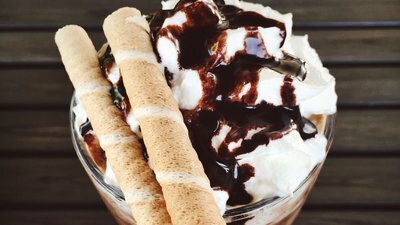 For one, tubs of Chunky Monkey and other ice cream varieties are often packed with sugar that can contribute to fat gain. The high amount of fat in the icy treat can also force your digestive system to kick into overdrive, which can lead to disturbances in sleep and, therefore, less of a chance that your body will recover properly from the gym beat-down you put it through earlier. Also be leery of brands made with chocolate or caffeine that can rev you up when you should be mellowing out. Cottage cheese packs in a wealth of casein protein, which is slow-digesting. This means that snacking on the "great white" can help supply your body with a steady amount of muscle-building amino acids throughout the night. The high amount of soluble fiber present in chia forms a gel in your gut and further spreads out the release of the anabolic amino acids in the cottage cheese. Fiber also promotes satiety, which can keep your hands out of the cookie jar when burning the midnight oil. It's hard not to get tempted by the appeal of ripping into a bag of crunchy pretzels when cruising the TV channels after a long day. And aren't they way better than greasy chips? Well, it turns out this baked snack food isn't so benign after all. The problem with pretzel snacks is that they're made with white processed flour, giving them a sky-high glycemic index. This can not only encourage fat storage late in the day when your metabolism is slowing, but the spike in blood sugar can also disrupt healthy sleep patterns. It's also very easy to lose track of just how much you're eating; before you know it, you've polished off a whole bag and put yourself into calorie overload. Yes, seriously, seaweed! Not just for sushi, seaweed snacks such as Annie Chun's are made from roasted seaweed so they're brimming with a crunchy umami flavor that's strangely addictive. And with only about 30 calories in 10 sheets, there's no guilt in killing off a package at a time. Not to mention you'll benefit from the naturally occurring vitamins and minerals present in the gifts from the sea. Drop your spoon into fruit-flavored yogurt and you could be getting an unwelcome surprise: plenty of sugar. And we have already established that sugar is not supportive of a chiselled physique when consumed during the post-dinner hours. The main point of contention with blueberry, strawberry, and other fruity yogurt is that refined sugar is often more prominent than real fruit. The benefit of plain yogurt is that you get plenty of muscle-building protein without the onslaught of gut-busting processed sugars. You can choose Greek- or Icelandic-style yogurt for an even bigger protein wallop. Stir in a touch of calorie-free vanilla extract and you'll instantly make creamy yogurt taste more like dessert than a healthy snack food.